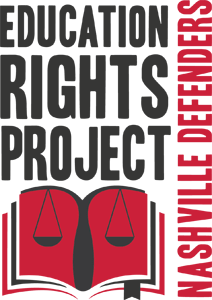 Education Rights Project advocates to ensure that Nashville’s children with disabilities get a quality education, graduate from high school, and avoid contact with the juvenile justice system. School is powerful. Children who stay in school are more likely to stay out of the criminal justice system. Keeping children in school can improve their lives. African-American men under age 35 who did not complete high school are more likely to be in prison than employed. (National Research Council, 2014). We advocate for students with disabilities to have a good education and a bright future. a program of the Nashville Defenders' Office.